Many weeks ago, before we embarked on pre-festive season efforts, on a typical post-work-week quiet Saturday night at home there was an email in my in-box promoting The Screaming Jets 25th Anniversary Tour. The Screaming Jets, an Australian pub rock band are regulars on my playlist. The G.O. doesn’t mind their music but played at a much lower volume than is my preference. In recent years we’ve tended less to go to big concerts and crowded venues. And because of his tinnitus loud music isn’t the G.O.’s thing. But a local gig at The Factory Theatre, Marrickville, $45 tickets and all work no play makes life very dull indeed, inclined the G.O. to agree to my suggestion that a Saturday night out was do-able. Of course when it came around, the G.O. had worked 6 days in 40 C plus temperatures, I’d been busy with work and domestic stuff and what seemed like a good idea at the time now seemed to be just one more thing to do. And preceded by a last-minute email advising The Screaming Jets would be on stage from 9.45 pm it seemed way past our bedtime. But it was the later start that saved us after our respective days of work & errands; allowing time for a late afternoon rest and a minor melt-down on my part as I was worried the G.O. was too tired, it was too late, too hot, too loud, too far… followed by an enjoyable mid evening stroll over to the Golden Barley Hotel for a nice dinner in the beer garden and a further short stroll through Enmore Park to the gig. While quite at home in the city there are times I lack my particular “tribes” who are far-flung in terms of distance and/or lifestyles. My best friend Mrs S., a fellow Screaming Jets fan and her hubby were initially keen for a night out but couldn’t settle on arrangements. Nonetheless, as the G.O. and I sat ourselves down with a couple of Mythos beers at the bar amongst the blend of ages, types and fashions; it appeared dressed customarily in jeans, boots and black t-shirts, we were in the right place. More apparent even after 10 pm when still with drinks in hand we made our way inside, the music started, the crowd chanted, photos & recordings were encouraged, and friendly hands extended to the stage were reciprocated by the band. Lead singer Dave Gleeson in between songs chatted to the audience, not necessarily politically correct but peppered by humour and social commentary, and we loved it. I loved The Screaming Jets’ own set, and the few covers: Johnny Cash, Slim Dusty and Bon Scott era AC/DC, acknowledging the band’s roots. Encouraged by Dave the modest sized crowd sang, knowing every beat & word to every song. After midnight, deaf as posts, we wandered home. I was elated. The G.O. was just tired but happy I was happy. It was only after the weekend, reading The Practical Mystic’s post “The week leading up to a new moon (Saturday’s Sagittarius new moon) has a distinct flavour to it – influenced by the dark moon, we have a tendency to become quieter, more introspective and sensitive. The best thing to do, is as much as possible honour those feelings by clearing your schedule of all but the essentials and include as many self-nourishing activities as possible”. Well, our new moon Saturday night out was quite the opposite of the suggested tendency but it was fun, and fun is what I most definitely needed. Accompanying me was an unselfish gift from the G.O. and me accepting such generosity does us both good. This coming G.O. work-site-shutdown weekend is the culmination of the recent weeks of preparations, where we’ll travel to visit family tribes, deliver Christmas gifts to those we won’t see on the day, and make ready our house at Taylors Arm for the festive season and holidays. As we go about, we’ll make a little time for ourselves and have some more fun. I could get used to it. “Before silverchair came along The Screaming Jets were the most popular band to emerge from the Australian industrial town, Newcastle. More than silverchair, The Jets’ music is a product of that town. When the original band members were growing up in Newcastle they faced a future of either working in the steelworks and associated industries or not working at all. In a town like that the locals live hard, drink hard and want their rock hard. The Screaming Jets gave them what they wanted. Postscript: An interesting manifestation of Saturday’s Sagittarius new moon astrological conditions… but not what I wanted, needed is a throat infection. Nevertheless that is what I have. I am certainly “quieter, more introspective and sensitive”. So I’ve cleared my schedule of all but the essentials and am focusing on self-nourishing, and healing. This entry was posted in Blog and tagged Australia, music, my life, Sydney, The Screaming Jets. Over the past few weeks I’ve been spending a lot of time with another man. The G.O. doesn’t mind, he’s a fan too… of The Man in Black: Johnny Cash. It started with a book – Johnny Cash: The Life by Robert Hilburn, my book club’s selection earlier this year I purchased despite being a weighty paperback tome knowing the G.O. would enjoy it also, but the size of which was practically daunting to lug for daily commute reading time on the train. “In this, the definitive biography of an American legend, Robert Hilburn conveys the unvarnished truth about a musical superstar. Johnny Cash’s extraordinary career stretched from his days at Sun Records with Elvis Presley and Jerry Lee Lewis to the remarkable creative last hurrah, at age 69, that resulted in the brave, moving “Hurt” video. We already had a few Johnny Cash albums in our collection including the more recent American IV – The Man comes Around; American V – A Hundred Highways; and American VI Ain’t No Grave, which I have to confess at first I didn’t appreciate and languished in a cupboard. But, reading Robert Hilburn’s biography set me off on a shopping mission for classic recordings such as Folsom Prison and The Essential Johnny Cash plus the earlier of the Rick Rubin produced albums: American Recordings; Unchained (American II); and American III – Solitary Man. Just after the book went back on the shelf awaiting the opportunity for the G.O. to read it I noticed a promo for The Man in Black – The Johnny Cash Story, a show at the Sydney Opera House for which I had tried unsuccessfully to get tickets during its previous tours. 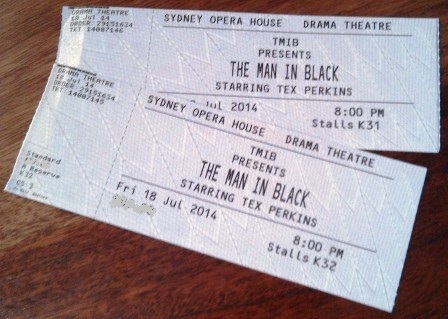 “The Helpmann Award winning The Man in Black… Starring Tex Perkins, this is two hours of Johnny Cash’s magnificent music interwoven with the story of his rise to stardom, his fight for survival and his eventual redemption. With his driving freight-train chords, steel-eyed intensity and a voice as dark as the night, the legendary Johnny Cash revolutionised music. The show explores his relationships – with hardened prisoners to the beautiful June Carter and lots in between. Johnny Cash was dealt a very tough hand, early in life, but through his music and dedication, he became a legend throughout the world. Tex Perkins, one of the most electrifying front men of Australian rock ‘n’ roll, brings the hard-living country legend to life, and is joined on stage by Rachael Tidd and The Tennessee Four. The weather was chilly last Friday night when we went but the show was brilliant, Tex Perkins doing an amazing account of The Man in Black, and the wintry late evening trip home well worth braving for the experience. I couldn’t really say a favourite song but “Hurt” originally recorded by the Nine Inch Nails and later covered by Johnny Cash was powerful. Over the weekend the G.O. and I both were still humming the tunes. He was an extraordinary man. This entry was posted in Blog and tagged Australia, book review, Johnny Cash, music, my life, Sydney. Press the button on the solar panel powered sign & Slim sings When the Rain Tumbles Down in July, written at the home. As my thoughts turn to escaping the city for a few days & heading north to Taylors Arm (NSW Australia), I thought to share a little known tourist attraction close to our home there. Australian country music singer Slim Dusty is famous for a song called Pub With No Beer. The name of the pub at Taylors Arm is The Pub With No Beer. Legend has it Gordon Parsons penned the song later recorded by Slim about Taylors Arm’s Cosmopolitan Hotel (later renamed). However, there is ongoing controversy about the veracity of the location by other Pub With No Beer contenders. According to Wikipedia The Pub With No Beer at Taylors Arm is the real deal. 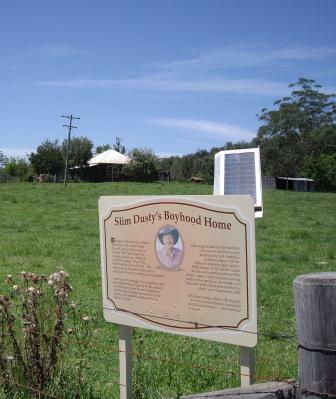 Slim Dusty came from the nearby Kempsey area and there is a memorial to him at his boyhood home at Nulla Nulla Creek about an hour’s drive via the scenic route from Taylors Arm. Press the button on the solar panel powered sign & Slim sings When the Rain Tumbles Down in July, written at the home. Just in case you’re wondering, The Pub With No Beer at Taylors Arm does have beer and many other types of refreshments. This entry was posted in Blog and tagged Australia, Kempsey, music.